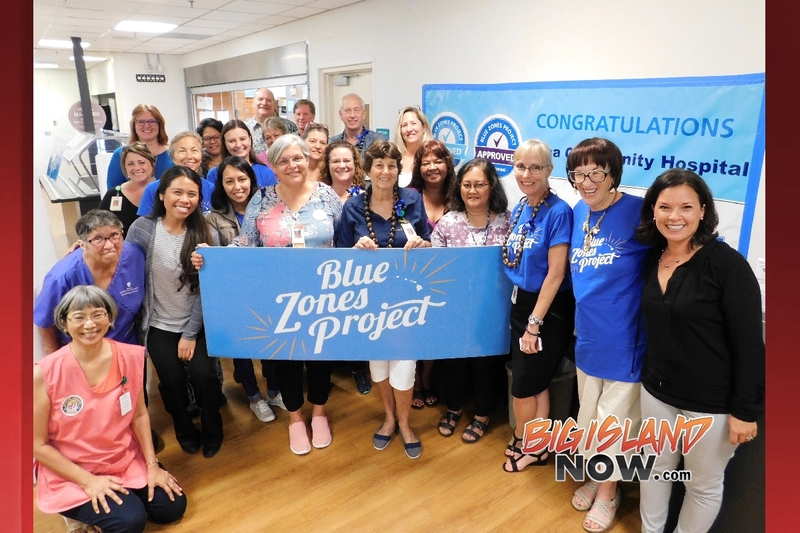 Kona Community Hospital (KCH) announces they are celebrating their recognition as the first hospital to become Blue Zones Project Approved on Hawai‘i Island and the second in the state. 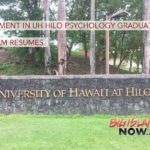 Their approval is two-fold, as the hospital is being recognized as a Blue Zones Project Approved worksite and restaurant. 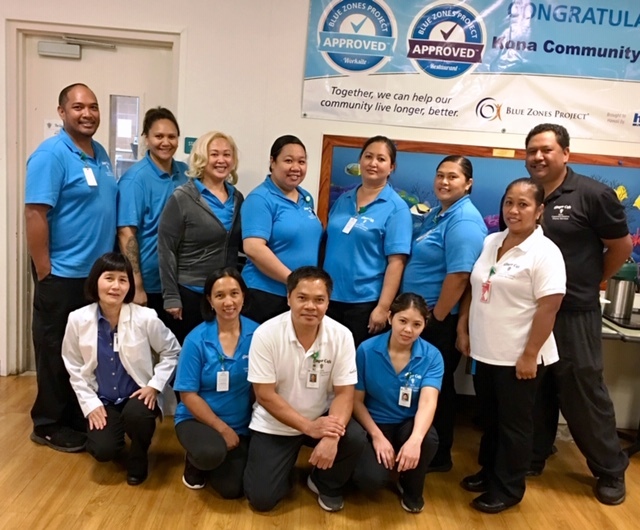 KCH employee group celebrating the Blue Zones Project achievement at Ginger Café, the hospital’s cafeteria and newest Blue Zones Project Approved Restaurant on April 11. Brought to Hawai‘i through an innovative sponsorship by HMSA, Blue Zones Project is a community-led well-being improvement initiative designed to make healthy choices easier through permanent changes to lifestyle, environment, policy, and social networks. Since being designated as a demonstration community in 2017, nearly 2,300 West Hawai‘i residents have engaged with the initiative and celebrated 16 worksites, schools, restaurants, grocery stores, and faith-based organizations that have become Blue Zones Project Approved. 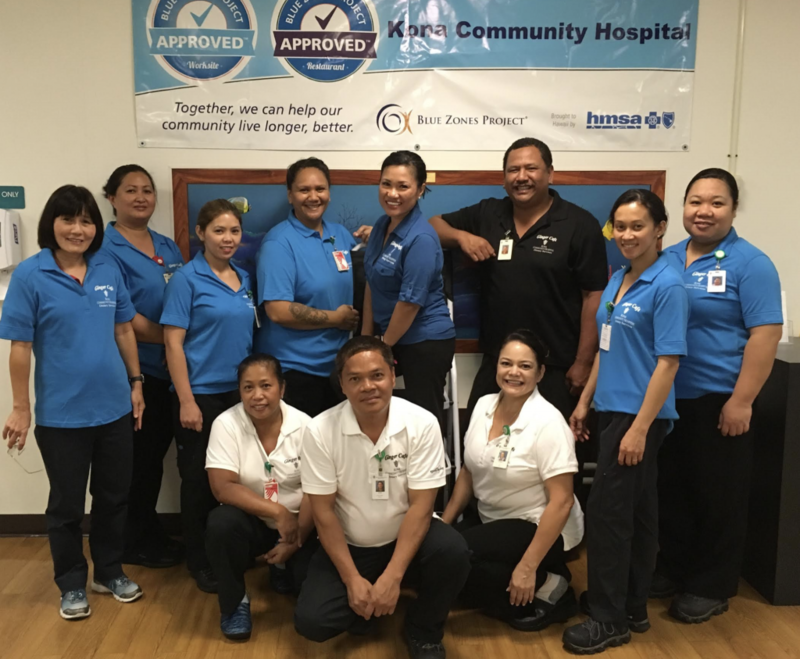 Kona Community Hospital achieved Blue Zones Project Approved status by successfully adopting best practices that promote well-being, including: Encouraging walking and/or standing meetings; Hosting a Purpose Workshop and a health fair; Offering employer-sanctioned fitness activities like yoga and hot hula; and improving food offerings for staff at Ginger Café. Ginger Café, a Blue Zones Project Approved™ restaurant, now features three Blue Zones Project Inspired Dishes – MaPou Tofu Vegetable Stew, Vegetable Quinoa and Tofu Vegetable Stir Fry. The Café has improved their menu by creating an electronic message board to better highlight healthy food options. Also new to Ginger Café is its new compostable dishes, as the hospital phased out all Styrofoam. 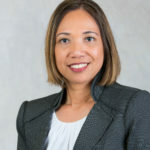 KCH strives to be a community leader by implementing initiatives that impact the health and well-being of employees and community members in a positive way. Achieving this accomplishment reflects the dedication of KCH to making changes that empower people to live healthier. 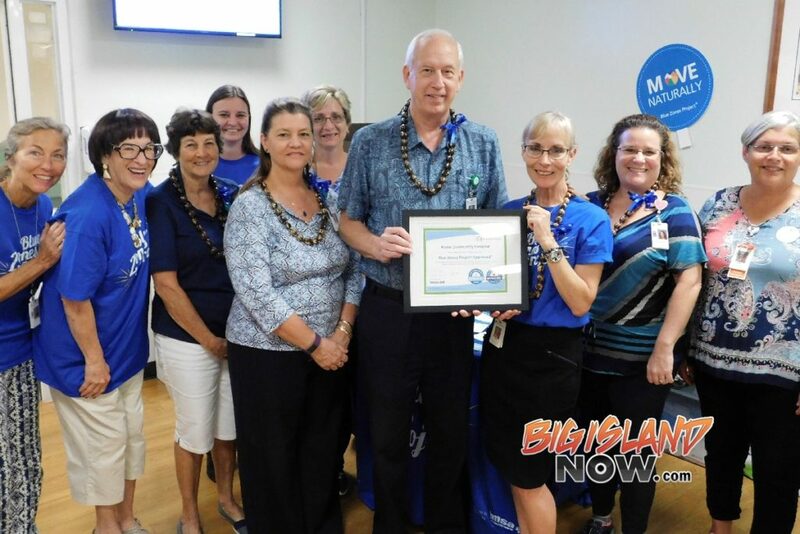 “At Kona Community Hospital, we’re very proud to be the first hospital on Hawai‘i Island to be dual certified as a Blue Zones Project worksite and restaurant. 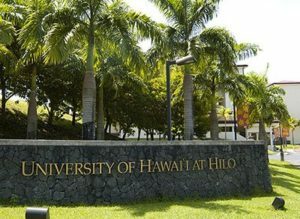 Because we’re committed to promoting health and wellness of our employees and our community, we’ve embraced the Project’s philosophies to support a healthy on-campus environment,” says Jay Kreuzer, CEO of Kona Community Hospital and the West Hawai‘i Region of Hawai‘i Health Systems Corporation.